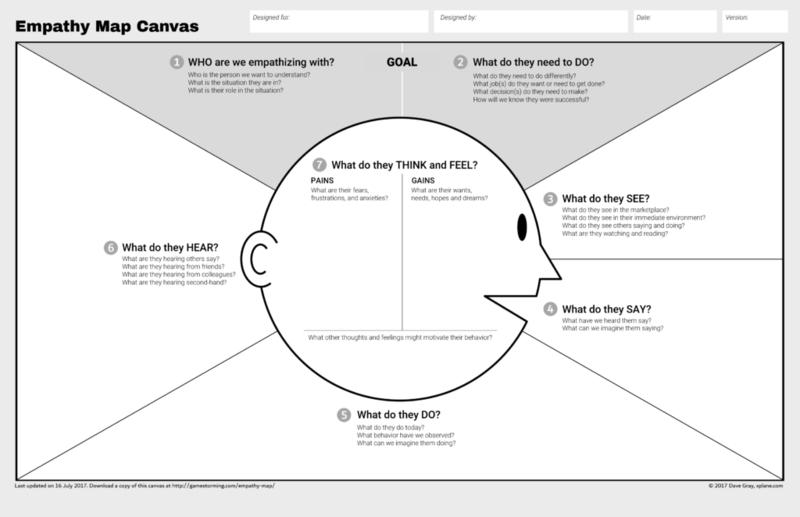 A very nice post by David Bland over at scrumology shows you, step by step, how to make an Empathy Map in Google docs. What a great idea. Check out the post or Brand’s Google doc example. View more presentations from AdilsonJardim. Today, companies in every industry seek to better their design capabilities: from products to services to experiences. 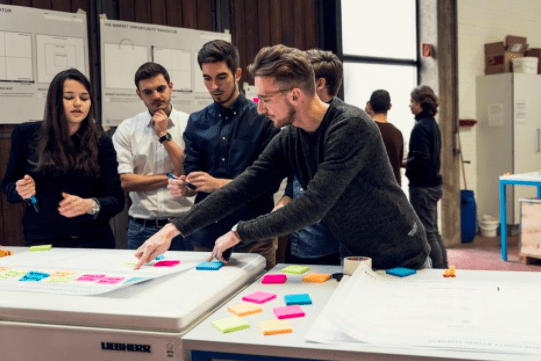 Fueling the growing design function in large organizations is a new discipline called Design Ops, charged with scaling design and design thinking up, down, and across the organization. 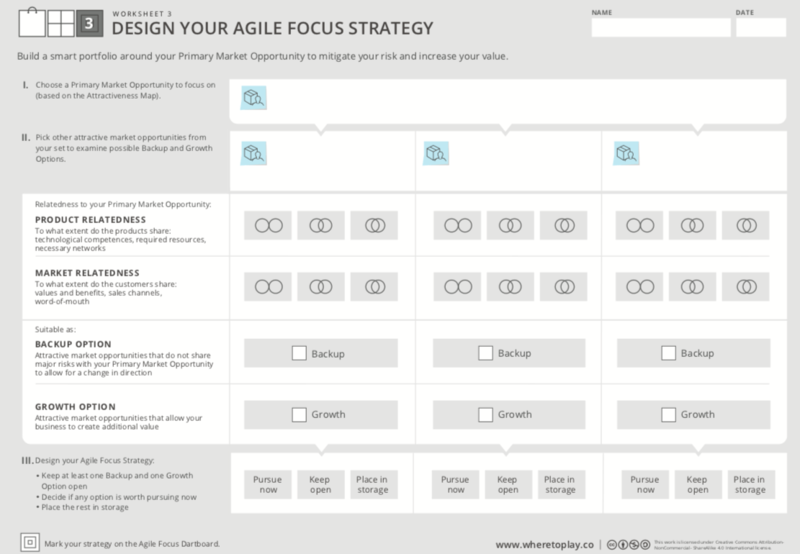 Does your organization have a Design Ops function? If not, let’s design it! Build shared understanding of how Design Ops operates within the larger organizational context. If a current Design Ops function exists, to visually map it. If it does not yet exist, to design it. 1-6 (depending on the objective). 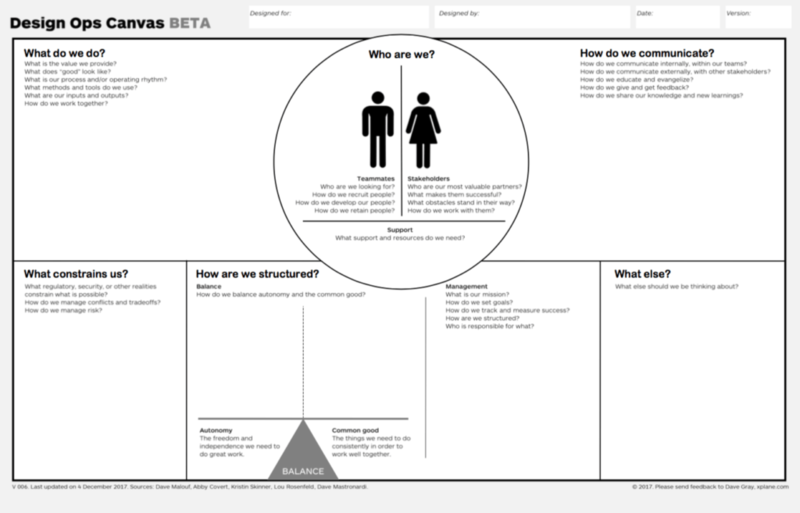 As an individual, use the Design Ops canvas to quickly sketch out and think through a Design Ops organizational model or an interesting model portrayed in the press. To map an organization’s existing and/or future model you should work in groups. Include partner organizations (e.g. project management) and stakeholders (e.g. clients). The more diverse the group of players, the more accurate the picture of the Design Ops function will be. Anywhere between 15 minutes for individual play (napkin sketch of a Design Ops model), half a day (to map an organization’s current Design Ops model), and up to two days (to develop a future Design Ops model, including vision, mission and metrics). There are several games and variations you can play with the Design Ops Canvas Poster. Here we describe the most basic game, which is the mapping of an organization’s existing Design Ops org (steps 1-3), it’s assessment (step 4), and the formulation of improved or potential new org designs (step 5). The game can easily be adapted to the objectives of the players. Start with the Stakeholders in the Who are we? circle. Use different color sticky notes on the Canvas Poster for each type of stakeholder (e.g. external vendors, internal support functions, clients). Complete this section. Subsequently, move to the What do we do? 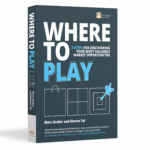 section and map out the value propositions your organization offers each stakeholder. Players should use the same color sticky notes for value propositions and stakeholder segments that go together. 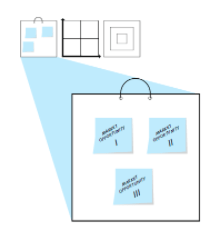 If a value proposition targets two very different stakeholder segments, the sticky note colors of both segments should be used. 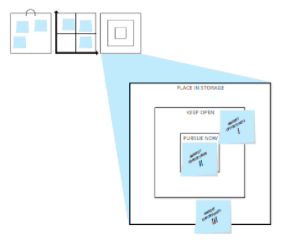 Map out all the remaining building blocks of your organization’s Design Ops model with sticky notes. Try to use the colors of the related stakeholder segment. Recommendation: once you complete the Stakeholders section, work around the canvas clockwise, beginning with the upper left section; leave the What Constrains Us? section last. 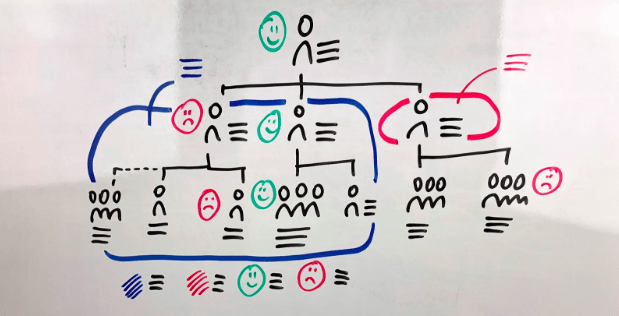 Assess the strengths and weaknesses of your Design Ops model by putting up green (strength) and red (weakness) sticky notes alongside the strong and weak elements of the mapped model. Alternatively, sticky notes marked with a “+” and “-” can be used rather than colors. Try to improve the existing model or generate totally new models. You can use one or several additional Design Ops Model Posters to map out improved org models or new alternatives. This powerful game opens up channels of dialogue about a new, lesser-known but vitally important design function. Use this game as an opportunity to not only create a thoughtfully designed and productive organization, but to introduce and educate the rest of the company about what design can do and how to plug in. Players not familiar with design may stay silent at first, but their participation will increase understanding and alignment, benefits with payoff into the future. Keep them engaged. 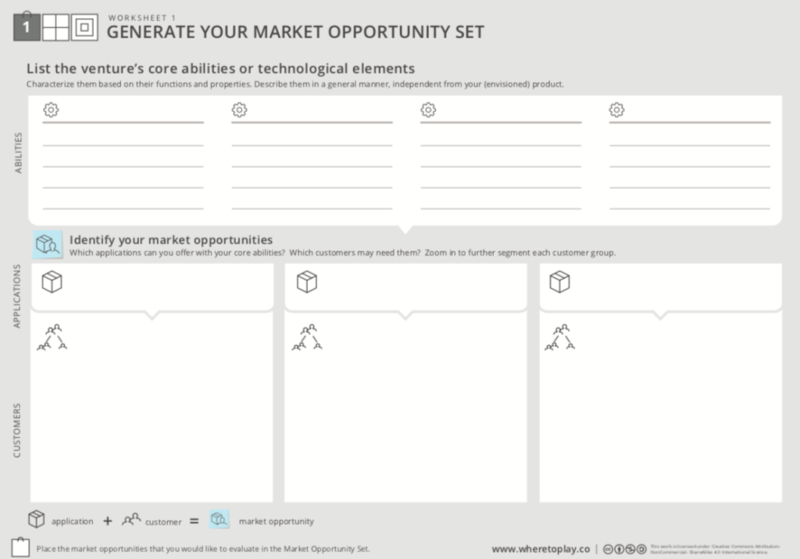 Beyond including outside stakeholders in the game, use a completed Design Ops canvas as a conversation starter in evangelizing Design’s value to your company. 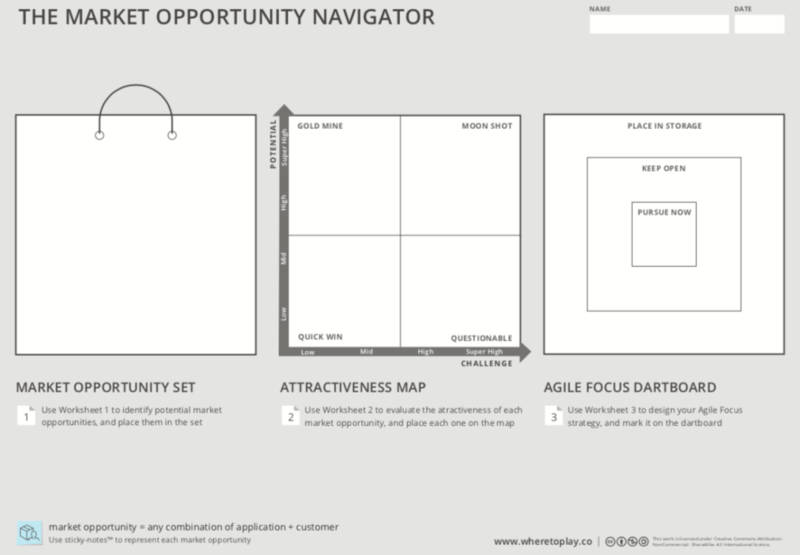 The Empathy Map will help you to more deeply understand your stakeholders; play this game before Mapping your Design Ops org. 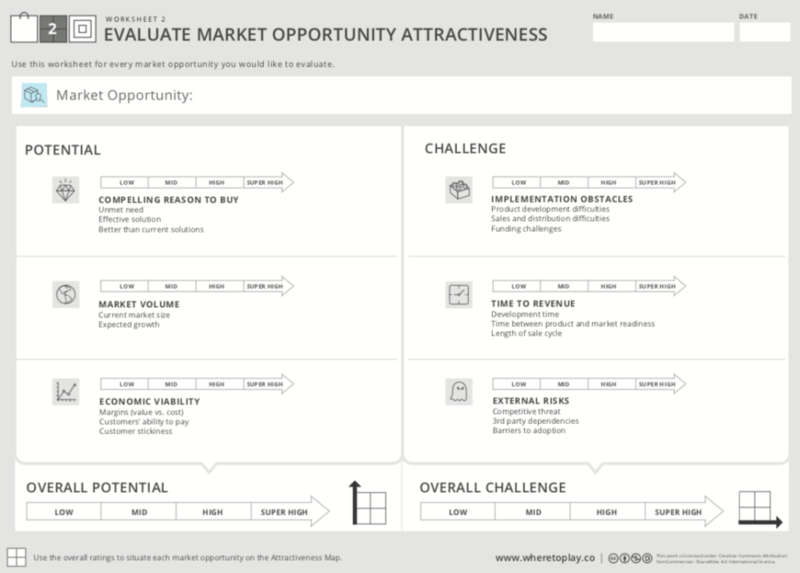 The Business Model Canvas will provide a more technical (managerial?) 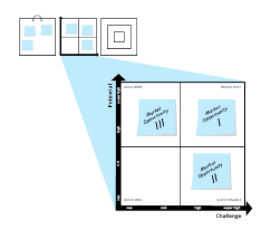 understanding of how your Design Ops org functions; complete the Business Model canvas after mapping your Design Ops org. In the event you are looking to improve upon your current state, the Business Model Canvas will prove especially useful. You need a good oversight to think about your future, or to really understand your clients. You are committed to empathically include everybody’s reasoning and arguments. You want to make wise and just decisions. Making the right choices and decisions is crucial. Often too, we need to decide fast. Do we need to vaccine the world population against swine flu? Should we enter this new market? 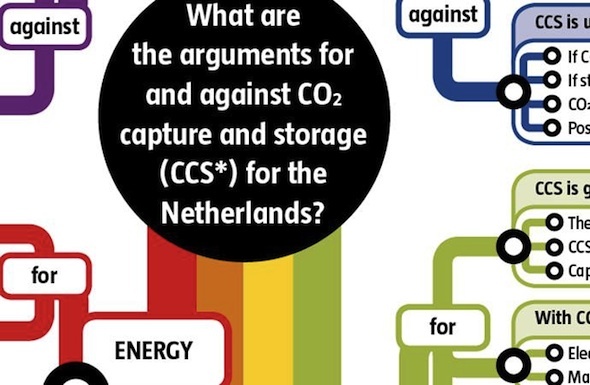 Can we still trust science after Climategate? Are we going to bail out Greece and Ireland? Can computers think? Do we need a new monetary system? The [[argument map]] is a systematic approach to mapping a debate in a pleasant and high-quality way as a [[big visible chart]]. It’s process invites every stakeholder to carefully listen to each other’s arguments. It moves away from debate and towards mutual understanding, encouraging empathy. When people are forced to examine other peoples’ points of view there’s a chance for a real conversation. Generate, collect, prune, and cluster all arguments for and against in a tree-shaped structure on a single A3 sheet of paper. Use the [[force field analysis|force field map]] to chart weighted forces that direct change. The [[argument map]] is originally conceived by the Argumentenfabriek. Public debate often diverts into endless low quality discussions and exhausts both the debaters and audience. At the end, you still can’t make a well-informed choice. Many conversations suffer from lack of a central theorem or stand, scarce arguments in favor, or ignored counterarguments. The goal is to get out all of the issues and arguments before talking about any one issue. Real-life dialogue makes this a challenging goal, yet it is the goal nonetheless. You will never get the complete list and may miss significant opportunities. You will end up talking about an issue, which is not the most important issue. Even if you eventually discover the most important issue, you may have depleted the scarce resources of time and energy. People have trouble to remember a lot of connections between statements and arguments, and suffer from infoglut—masses of continuously increasing information, so poorly catalogued or organized (or not organized at all) that it is almost impossible to navigate through them to search or draw any conclusion or meaning. A [[big visible chart]] like the [[argument map]], [[force field analysis|force field map]], or [[hoshin kanri]] gives oversight. Visualizing reasoning helps in practicing critical thinking: clean reasoning, focusing on errors of reasoning, unspoken assumptions, and psychological digressions. [[big visible charts]] will increasingly take over long-winded texts. There is simply no time to read and understand the ever growing thickets of documents. 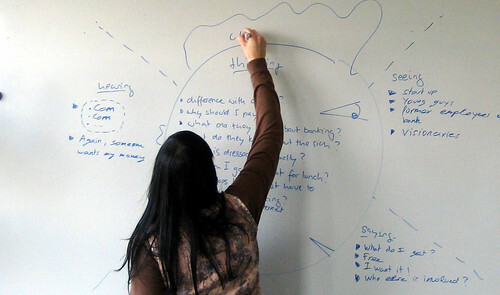 Either use a whiteboard or flip chart or a computer projection and some handy outline software. Step through the process below, and everything important will surface. You will be complete and not miss any important issues or arguments. And you will be able to make a just decision. Just the Facts—Create a [[facts map]] and briefly share facts and figures related to the topic. No opinions, just (verifiable) facts, please. Quiet Brain Dump—Take ten minutes or so to find causes and consequences, pros and cons. Jot down any argument you can find in favor or against the case. Take Turns and Share—Take turns and share a single argument with the group at each turn. Got nothing more? Just pass. Write down the argument on the whiteboard or type in on the computer. Prune Your Arguments—Delete any argument on your list that someone else also brings up as soon as you hear it. Be Terse—Relentlessly end any discussions, long-winded stories, or salvo of arguments. Exhaust Yourself—She or he who passes last, ‘wins’. Still not exhausted? Loop back to 3. For or Against—Take two flip charts. Label one as “For” and one “Against”. Collect the arguments on their appropriate flip chart. If you are using an outliner software program, simply drag each argument in its appropriate “For” or “Against” class. Shape, Organize and Thicken—Shape, organize and thicken the arguments. Cluster and categorize the arguments into ‘themes’, facets or aspects. Pick one to three key words for theme name. Within each theme, further subcluster arguments and label each cluster as a theorem, proposition, opinion, or stand, listing the arguments below. Often you will find similar themes and labels in both “For” and “Against”, but this is not a requirement; they can differ. Instead of listing arguments and copying them to flip charts, you can also write them down on sticky notes, one argument per sticky note, and put those on the flip chart. Crumple any duplicate stickies. Repeat this process with other groups of stakeholders. If you have the time and money, process the harvest into a colorful tree-structured schema like the examples below. Make sure it fits on a single and handy A3-sized sheet of paper, while keeping it legible, of course. post hoc ergo propter hoc—‘false cause’. This article is a copy of Pareltaal » Argument Map and formatted like a pattern from a pattern language.